Ultimately if you want to be proficient in bushcraft and survival skills, you have to go outside, train in the skills and use them in practice. Even knowledge must be tempered by experience. There are no two-ways about this. But you can gain a great deal of guidance in which skills to practise and how to execute them by using books as a guide. 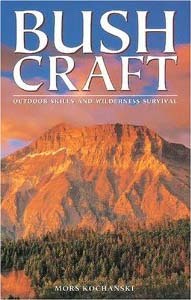 If you consider the books below as a syllabus, if you become proficient in the skills and can apply the knowledge contained in them, you will be a very capable outdoors person. All the books below come highly recommended. I won’t recommend a book that I haven’t read myself and all of them are on my bookshelf. The links to Amazon are affiliate links. I’m being completely up-front about this. If you buy one of these books after following one of the links below, a small percentage of the purchase price goes to this site. It doesn’t cost you any more to buy the book and it helps me to pay for the site without the need for intrusive and distracting advertising in amongst the articles. Everyone is a winner! I won’t put a book on here that I don’t think is good because next time you won’t believe me. My credibility with you is more important to me than a small fraction of the cost of a book. All the comments below are my own thoughts on the books and not from Amazon.